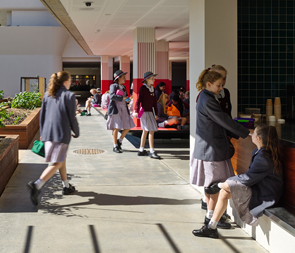 With each student’s needs as the focus, the Years 7 and 8 curriculum is structured around our clear focus on Community. This ‘big idea’ with the General Capabilities (Australian Curriculum) connects all Learning Areas within the curriculum, ensuring that students are provided the grounding of knowledge and skills in all Learning Areas, building a strong foundation for studies beyond this year level. Take a look at the Francis School in action. Students will experience a variety of courses in The Arts, Technologies, Languages, Humanities and Social Sciences. Research and Technology is a school-developed course of study undertaken by all students and provides grounding in digital citizenship, use of technologies, study techniques, use of the iCentre and other communication and collaborative skills. Students will experience a wide variety of courses in The Arts, Technologies, Languages, Humanities and Social Sciences. These foundation courses have been designed to create a comprehensive base for all Learning Areas, ensuring our students will be well equipped for their future studies and experiences at Mount Alvernia College. Students will then be able to choose some preferred subject areas for Year 9 and later years, providing they meet certain requirements of the College.